Free EDB to PST Converter Software is well illustrious program to quick and fastly repair corrupted & inaccessible exchange EDB file and also convert EDB to PST Outlook file. EDB Converter software gives quick response to users in case of EDB to PST Conversion and it enable users to save all recovered exchange mailboxes to PST, MSG, EML, HTML and EMLX format with all mailbox components like- emails, notes, calendars, task, emails and appointments etc. No File Size Limitation: Recover and Convert large-sized Exchange database to Outlook PST. Recovery of "Deleted Folder" Emails - Software has ability to recover deleted folder emails with properties and other items. 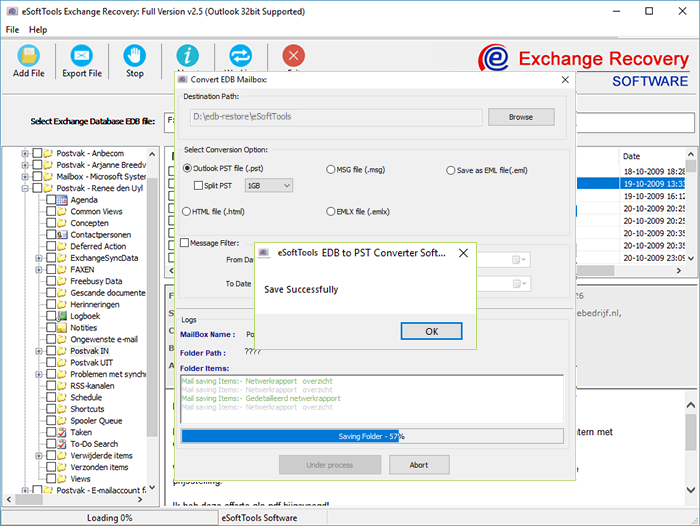 Recover Private and Public Folder Database - Exchange Recovery Software prominently support to recover exchange private (priv1.edb) and public folder(pub1.edb) database and export all stored user accounts to multiple formats. 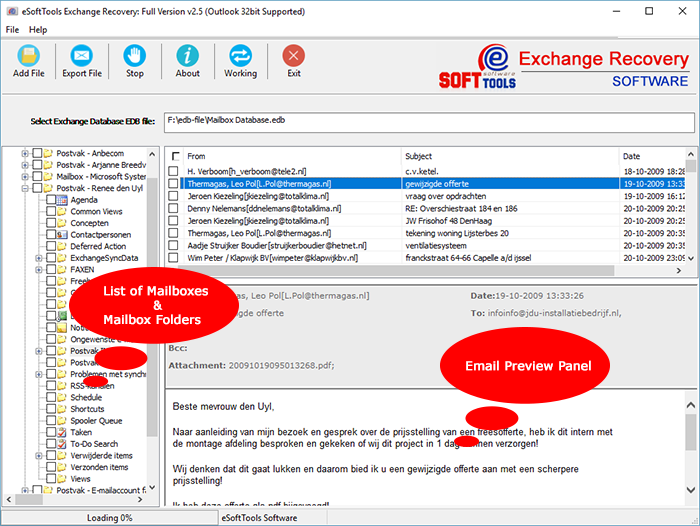 Export Selective Exchange Mailbox/Folders - Multi-telented software provides various way to convert exchange mailbox i.e Convert selective mailboxes or convert entire exchange mailbox to PST file. Convert EDB into Multiple Formats - Convert EDB file to PST, EML, MSG, EMLX and HTML file. Maintain Folder Structure Always - Software always takes care of original folder structure during EDB Conversion to PST file. Reduce Oversize PST File - While edb conversion, choose PST Split option to makes PST File small in size. Preview Facility - Software displays preview of EDB Emails, contacts, calendars, task, notes and appointments. Demo version EDB to PST software recover exchange edb file and save 30 items from every folders. 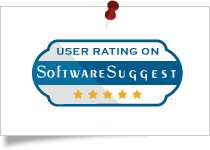 CNet awarded 5-star rating to eSoftTools Exchange Recovery for its clean and safe edb recovery and migration and simple user interface. 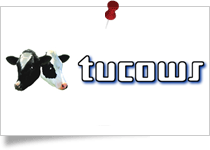 Read More..
eSoftTools EDB to PST Conversion achived independent listing on tucows.com product library on behalf of several sucessful testing about installation and working functionality. 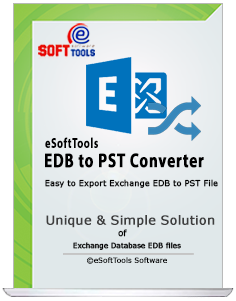 Read More..
Software Suggest recommended eSoftTools EDB to PST Converter Software for its unique and trustworthy conversion from exchange to outlook pst, eml, msg, emlx and html file. 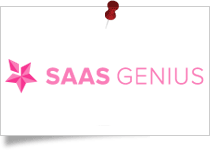 Read More..
eSoftTools EDB to PST Converter reveiwed by SAAS-Genius experts and found clean and 100% safe application for installation and uses. Read More..
During EDB to PST Conversion, the eSoftTools EDB Converter software let you save the selective mailbox items and its data through check/ uncheck checkboxes within software. Select required complete single or multiple mailbox from mailbox listing and export EDB mailbox to PST outlook, EML, MSG, HTML and etc. Previewing entire emails and attachments attributes is the well designed feature of EDB to PST Recovery Software that facilities users to get hint about the EDB file items that going to convert into PST, EML, HTML, MSG and EMLX format. EDB to PST Converter Software capable to preview EDB file emails, calendars, contacts, notes, journals & other user’s mailbox items. EDB to PST Converter software well perform to convert all the EDB mailboxe to PST (Unicode PST) file. It will convert all mailbox folders of EDB File such as- Inbox items, contacts folder, calendars folder, task, notes, journals etc. Converted EDB as Unicode PST file easily open by every version of MS Outlook including 2016. While Convert EDB to PST File, clients can likewise pick PST Split alternative of the EDB to PST Converter programming that will deal with the span of expansive PST document by part it bt extend 1-GB to 5-GB. EDB to PST Recovery Software offer users to recover edb emails with attachments by filtering messages according to date’s selection. All users can set the dates range “From Date” and “To Date” for edb recovery emails along with attachments with maintains emails properties and formatting. EDB to PST Converter Software best for fixing all errors from EDB file and recovery all items from inaccessible and dis-mounted EDB file. EDB Converter Software provides several formats (PST, EML, HTML, EMLX and MSG) to recover EDB file included- emails, contacts, calendars, task, notes and other. The converted PST File and MSG format can be directly open in MS Outlook for reading emails. Specification & Download eSoftTools EDB to PST Converter Software and Try it.. The Demo version software works like licensed software and open edb file with all user mailboxes and live show preview of every items. The demo software has conversion limitation and set to convert first 30-items from every selected mailbox folders. Demo version limitations auto removed once you applied the valid license key. Exchange Server: Support Exchange Server 2016, 2013, 2010, 2007, 2003 and 2000 edb files. MS Outlook installation is required for EDB file coversion. Can a Single Mailbox be saved to PST using EDB to PST Converter Software? Yes, The conversion phase is fully works by user command. If you want to export only single mailbox from exchange database then you can do it and software perfectly works on your command and convert selected mailbox to Outlook PST file and other file extensions. To avial single mailbox conversion, select the check-boxes inside mailbox name and proceed for edb mailbox conversion. Do I need to install MS Outlook or exchange Server for EDB to PST conversion? Yes, MS Outlook is required for EDB file to PST Conversion. But Exchange Server installation is not required for software operation and edb conversion. Is there any limitation on number of mailboxes that can be converted into required format? There is no limitation at all! Convert ‘n’ numbers of mailboxes from EDB files into Outlook PST, EML, MSG, EMLX and HTML format with maintained folder hierarchy. What is your software license validity? 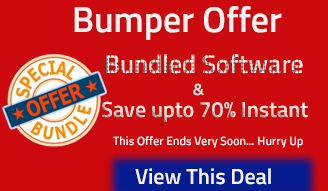 Software valid for life-time with full technical support and software upgradation. I want to export only few E-mails from one mailbox account without converting whole mailbox. How can i export? First load your Exchange database file and scan. Select your required user mailbox and see the preview of select mailbox email items. You have the check the email item from right panel of software and click right mouse button and convert your required emails in PST, EML, MSG files. Does the Demo version software allow saving of exchange mailboxes or emails? Yes. The demo version software full works like licensed version and allow to save 25 items from every folder. You can clearly preview the items and convert 25 items into Outlook PST, EML, EMLX, HTML and MSG file. I have windows 10 PC, does the software supports this? Yes, the software capable to supports windows 10, windows 8.1, windows 8 and below versions to perform convert EDB file to PST file. A conversion item from Exchange to outlook was the terrible task for me but your EDB to PST converter software made it so simple for me. I didnâ€™t face problem even if I had no technical experience or I liked its PST Split option that was being proven good for me because I had large Outlook file that may lead outlook corruption thanks a lot..
Hello, this is great program for EDB to PST conversion. I used this when my EDB file shown dirty shutdown errors, it worked quickly to solve my EDB file corruption issues and repaired my EDB file with recover EDB Emails, contacts, calendars and appointments. I want to recommend this EDB Converter Software to every users of outlook for conversion. I tried demo version software with exchange 2010 edb file and its perfectly show up all my user mailboxes and its data. I surprised a lot how this software works and give us to view all mailboxes. Now i purchased the license and retrieve back edb mailboxes to pst file. thank a lot to make this application. Very effective and result oriented software for exchange server recovery! I used it from last 3-month when i need to export edb to pst file. I would like to convert edb mailbox to pst file specially and this product works great for this job. Thank you for designing more powerful solutions.